Motorola and Google both don't even care about keeping the Moto X a secret, plastering it on its August 1st announcement invitation and letting Eric Schmidt bandy around with the thing, so hey, don't be surprised if a few details of the phone leaks. The Verge and @evleaks are reporting that the Moto X will have a 4.5-inch display, dual-core 1.7GHz Snapdragon processor, 2GB of RAM and a 10-megapixel camera. Oh, and a back shell made from Kevlar. 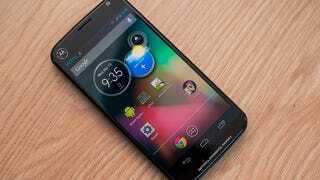 The Verge also adds that the Moto X will only have 1500mAh of battery oomph* and that the 'always listening' feature must be enabled to work. The camera will apparently open upon a flick of the wrist (we'll have to see how well that works in real life before casting judgement). Update: Looks like the battery juice isn't exactly confirmed. Verge says that's the number reported by the software. Exact capacity could be much different from that.